Toast up the almonds in a saute pan, naked, on high heat until they get toasty and smell delicious. Pop on a plate. Melt the chocolate over a double-boiler. 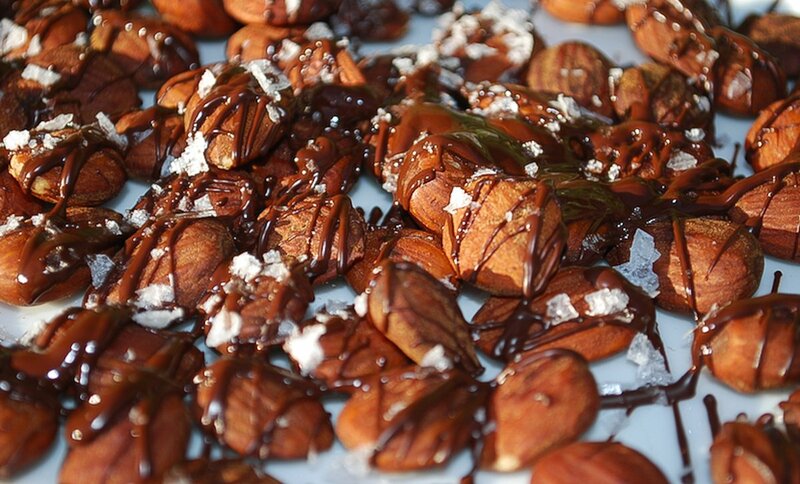 Load up a spoon with chocolate and use flicks of the wrist to sprinkle the chocolate over the nuts. Sprinkle with Maldon flake salt for maximum prettiness. Pop into the freezer to harden the chocolate until you are ready to serve (since nuts don’t freeze, you are fine indefinitely.) Goes great with bourbon for cocktail hour!